The Aesthetics of Composition in Abstract Painting: Artwork of the month: Temptation. Artwork of the month: Temptation. I am not the kind of man to fall for religious oil paintings, albeit this painting is a masterwork. 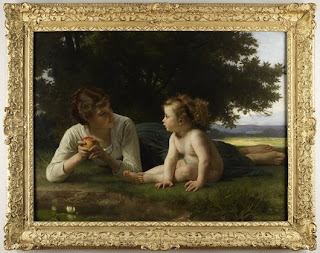 In fact almost everything Bouguereau painted was a masterwork. The subject, well just make up your own mind. I like to think mom is giving her "knowledge" not temptation. Go to my temple and see this painting anytime you want.